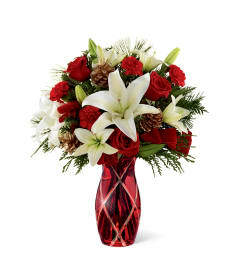 Kathy Ireland Home invites you to redefine your vision of sophisticated holiday glamour with this stunning bouquet. 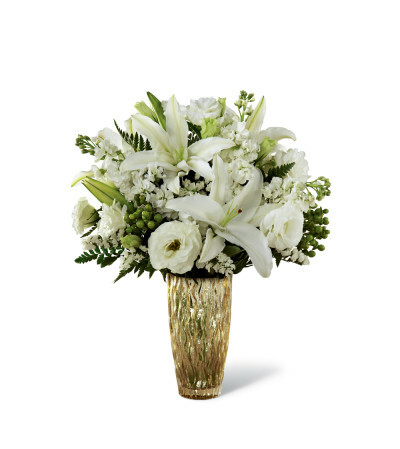 Simply stunning with understated elegance, this heavenly white floral composition includes lilies, statice, stock, exotic lisianthus and hypercium berries hand-arranged in a contemporary glass vase and rippling with a shimmering golden finish. Exquisite! 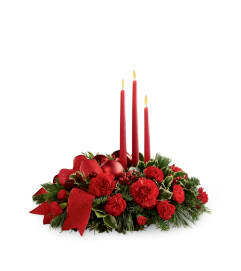 It takes seasonal festivity to a whole new and exciting level of luxury.